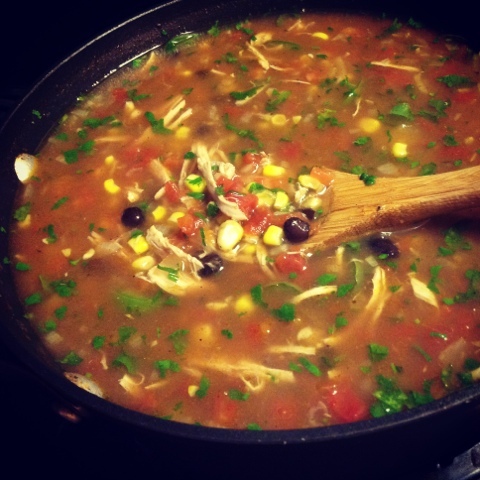 Tonight we are making our Chicken Tortilla Soup and honestly, this could not be easier! If you're just starting to cook for yourself or nervous in the kitchen, this is the perfect meal to make because it's fool proof and super delicious. The skinny shortcut here is starting with a little help from the store and buying a rotisserie chicken. To keep it healthy, always remove the skin! Store bought rotisserie chickens also tend to be pretty high in sodium so this dish won't need any extra salt to season. To start, we sauté up red onion and garlic until fragrant. We add in low sodium chicken stock, diced tomatoes, black beans, corn, sliced jalapeños and our rotisserie chicken. Right before serving, we mix in a large handful of cilantro and top with fresh avocado chunks and a tablespoon of crispy tortilla strips for a crunchy finish and a pretty presentation. This soup has the perfect kick of heat from a pinch of cayenne pepper and sliced jalopeno balanced by the cool creaminess from our avocado topping. Delicious! When making a big pot of soup, we always make double to freeze. One of our best skinny secrets is to have homemade healthy dinners in the freezer for those nights we are too tired to cook. Most of our recipes feed 4 (despite the fact that we are only cooking for two!) because we always try to freeze a portion for another night. If you're going to spend the time to cook up a healthy & delicious dinner, don't you want to enjoy it twice? 1. Heat deep sauté pan over medium heat and add one tbsp of olive olive. Add red onion & garlic and sauté about 5-6 minutes until fragrant. Mix in your cayenne, cumin and chili powder. 2. Add in chicken stock, tomatoes, black beans and bring to a simmer. 3. Stir in shredded chicken, corn and sliced jalopeno. Cook at least 30 minutes. 4. Scoop out and dice avocado. 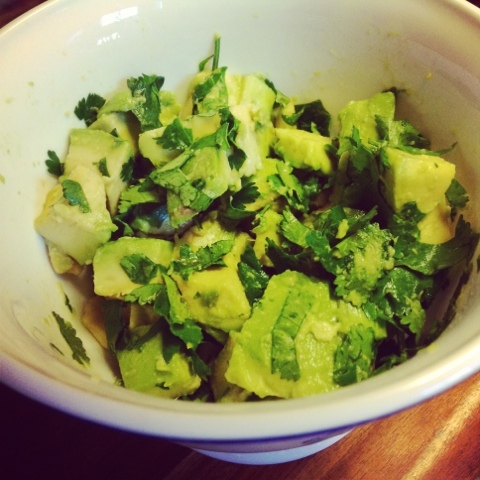 Add to bowl and mix in lime juice & 1 tbsp of your chopped cilantro. 5. Before serving soup, mix in the remaining chopped cilantro. Yum! 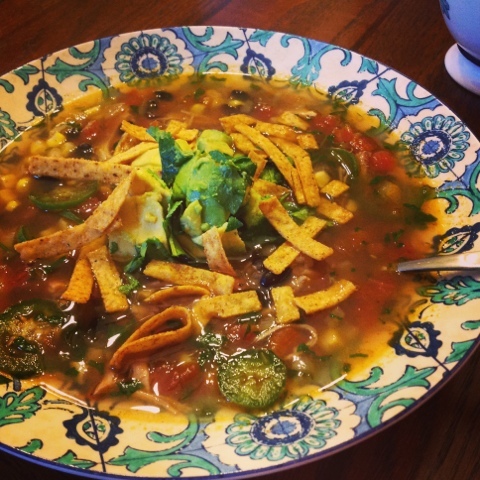 Love chicken tortilla soup, I'll have to try your recipe. Thanks so much for linking up with the GFC Collective!